Gillian Mitchell directed a panel discussion with Dr. Russell Ally, Executive Director of Development and Alumni Department at the University of Cape Town, and Shelagh Gastrow, Executive Director of Inyathelo: The South African Institute for Advancement. Dr Ally suggested that as a first step an organisation must clarify it’s mission. That means, defining a realistic and attainable organisational mission, not one laced with “blue sky goals” and NPO-speak prose. Only when an organisation, and most importantly those within the organisation, can articulate what it hopes to accomplish can it develop partnerships and cultivate interested donors. Shelagh added external relationships are often cultivated out of creating awareness that you exist through building their interest in what you do and ultimately, trust in your leadership and organisation. Social media, thoughtful use of annual reports, or your message out into the public in positive ways, helps create this awareness. Every month (from April to December), we focus on one of our Ten Elements, sharing useful resources, tips, know-how and expert advice and insights to help you with your efforts to ADVANCE your organisation and mobilise resources. On tap for August is Strategy and Planning. 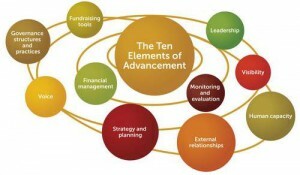 Inyathelo Pinterest Board on Building External Relationships for Fundraising for Nonprofits. Resources on Building External Relationships from ASK Inyathelo.